The Best Audience in the World! Yesterday, we had the pleasure of speaking to the best audience in the world. It was the drivers of the Boston DuckBoats. 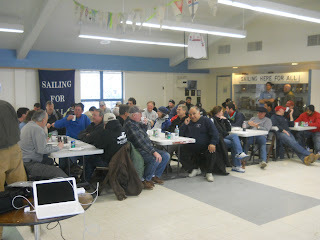 They invited MOP in as part of their annual update and safety training at Community Boating and the learning was fun and flowed both ways. Why was it so much fun? These folks have tons of personality. They cheered at good news, hissed when we talked of regulatory challenges, joked and engaged the speaker. It was wonderful! It also was impressive to learn about their safety training, licensing, interest in Boston's History. They were running through their annual Coast Guard inspection and going over safe driving practices. The average driver makes 100 decision in a mile. Now imagine making those 100 decisions while reciting Boston History and being entertaining. (This team is bright.) Did you know that Boston's largest hotel is the Sheraton with 1200 rooms? This pales in comparison with the Venetian Hotel in Las Vegas which has a wopping 6000 rooms. The drivers were enthusiastic supporters of MOP and thanked us for our work. They also asked me if I knew about the recent Sturgeon sighting. I did not! But it is an exciting sign of the ongoing improvement in our Harbor. The biodiversity is continuing to return. Here is a link to photos of the fish and a TV news story. Sturgeon are a bony fish that has survived since pre-historic times. They are distinctive for their elongated bodies, lack of scales, and occasional great size: sturgeons ranging from 7–12 feet (2-3½ m) in length are common, and some species grow up to 18 feet (5.5 m). Most sturgeons are bottom feeders, spawning upstream and feeding in river deltas and estuaries. They are largely confined to coastal areas. New York State reportedly has a blue sturgeon that can reach 200-300 pounds. They were once plentiful but have become rare to due to overfishing and the industrialization of our coast. The head of Community Boating, Charles Zechel gave a nice talk about the history of the organization, which originated with one man's effort to teach kids from Boston's West End how to sail in the 1930's. 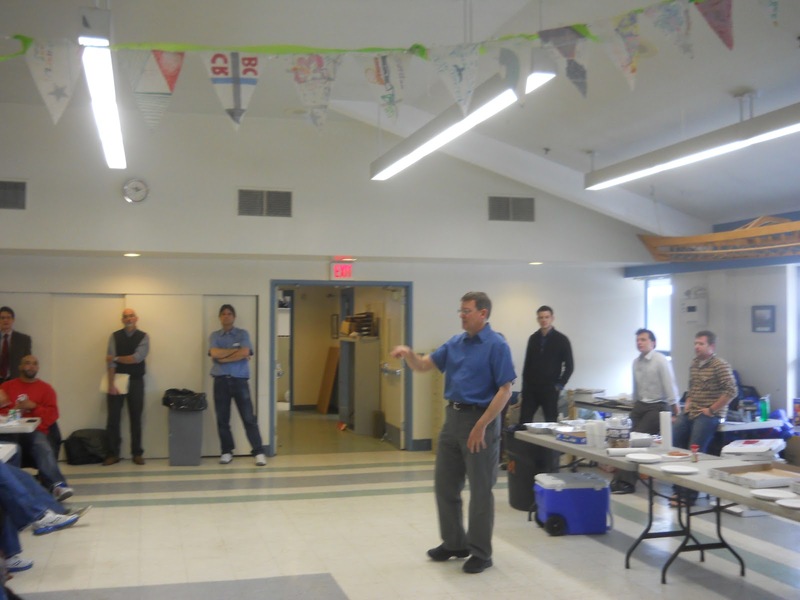 Joe Lee was connected the Storrows and able to demonstrate the benefits of constructively engaging the City's youth. Early in the 1940's the current structure was built and in 1946 after the war programs commenced. Tradition holds that sailing memberships are available to Boston youth for $1 and this is still true today (with an economic means test.) As an aside in the days before Match.com Community Boating was a great place for singles to meet and the author knows of several marriages that began there.They are currently taking reservations for the fourth of July Fireworks, so if you are a planner, now is the time to strike.